The Maine Department of Transportation selected Holophane HMAO LED high mast outdoor lighting fixtures from Acuity Brands to retrofit 105 light towers that illuminate Interstate 295. The Maine Department of Transportation (MaineDOT) selected Holophane HMAO LED high mast outdoor lighting fixtures from Acuity Brands to retrofit 105 light towers that illuminate Interstate 295. The HMAO LED high mast solution provides two benefits for the MaineDOT: evenly distributed white light for illumination and greater energy efficiency compared to the previous lighting technology. The high masts use 290 watts per fixture, and are rated to deliver up to 100,000 hours of maintenance-free operation. They feature multiple LED modules that reduce the potential for dark areas in the event an LED module fails. Through use of multiple LED drivers, the high masts offer the choice of various lumen packages, provide a backup light source and ensure overlapping distribution. Additionally, the fixture’s prismatic glass optics minimize the direct view of the light source for quality illumination. 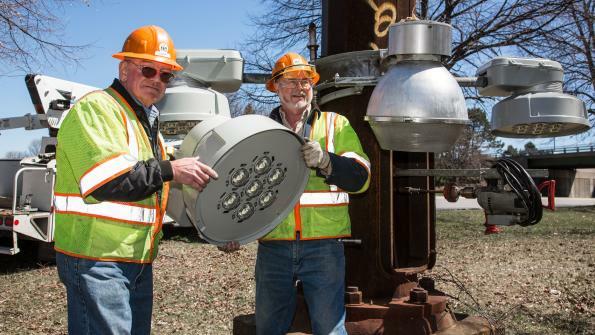 The state’s previous high-pressure sodium light fixtures were turned off each night from 11 p.m. to 6 a.m. in order to reduce operating costs, which left roads and rest areas dark during that time period. In addition, the previous fixtures left bright spots and glare on the road due to uneven light distribution. Electricity cost for each newly retrofitted light tower, operating from dusk to dawn each day, is only $66 per month, compared to $200 per month for each tower using the previous fixtures and operating a reduced number of hours. The reduction in energy cost allows MaineDOT to leave the lights on throughout the night, providing a safe transit environment. Once the retrofit project is completed, the HMAO LED high masts are expected to produce an annual energy savings for the MaineDOT of $135,000, or a 10-year energy savings of approximately $1.35 million. Light towers in the Falmouth area have already been retrofitted with the new high mast luminaires. The MaineDOT will also retrofit light towers in Portland, Saco, Kittery, Waterville, Bangor and Medway rest areas. This video showcases a variety of Holophane high mast lighting systems and explains the value of these kinds of systems.